The global laser displacement sensor market is prognosticated to witness a highly consolidated market scenario. There are handful of firms leading in the global market, and these firms are likely to come across a decent competition among their peer. The key players operating in the global laser displacement sensor market are SICK AG, KEYENCE Corporation, Panasonic Corporation, Cognex Corporation, TURCK GmbH Co., OMRON Corporation, Mechanical Technology Incorporated, Banner Engineering Corp., KG, ZSY Group Ltd., and MICRO-EPSILON. Firms are making efforts to come up with more innovative products, along with being cost-effective so as to retain their place in the market and improve in their global reach. 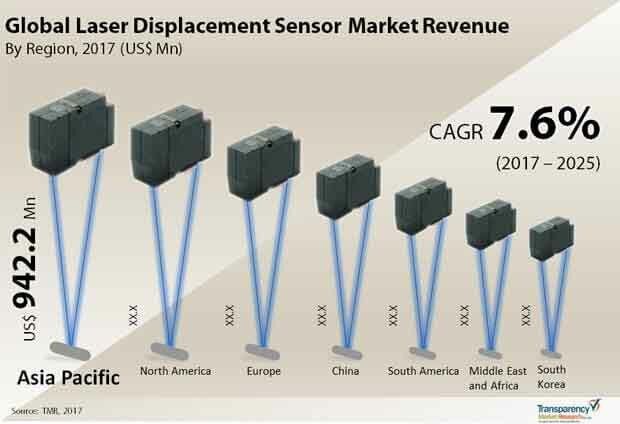 According to a report by Transparency Market Research (TMR), the global laser displacement sensor market was valued at US$2713.2 mn in 2016, which is foressen to saor around value US$5,201.4 mn by the end of forecast period form 2017 to 2025. The global laser displacement sensor market is estimated to grow at strong CAGR of 7.6% in the coming years. On the basis of range, the global laser displacement sensor market is segmented as 100mm to 300 mm, less than 100mm, and over 300mm. Among them, the range of over 300 mm segment range account for lead in the overall laser displacement sensor market. This is majorly owing to the presence of huge range of sensors in the aforementioned segment. Geographically, Asia Pacific region in 2016, dominated the global laser displacement sensor market, with highest revenue share. Supported by development in India, China, Korea, and Japan the Asia Pacific is foreseen to sustain its lead in the coming years as well. The rise of Asia Pacific region is credited to the established manufacturing industries, coupled with various vendors dealing in laser displacement sensor. The global laser displacement sensor market is foreseen to grow with leaps and bounds in the span of coming years. This is attributed to increasing popularity of automation, coupled with affordable practices regarding quality control. This is fueling the demand in global laser displacement sensors market. It has various applications in fields such as robotics, machine tools, material handling, and others. Apart from this, the rising usage of the laser displacement sensors in consumer devices and automobile parts, along with the surging demand in various sectors is fabulously contributing in the growth of the laser displacement sensor market across the globe in the coming years. The rise in adoption of robotics and industrial automation is another factor boosting the demand in global laser displacement sensor market. The companies operating across the globe are witness issues related with fluctuating cost of raw materials, rapid globalization, pressure to get revenue, and strict regulations. In order to gain operational efficiency, the makers all over the world are concentrating on advanced technologies such as, automation. Robotics and industrial automation used various laser displacement sensors and wireless sensors. Particularly, laser displacement sensors play an important part in industrial robotics since they help in features such as recognition, sensing, and interpretation. The growth in the global laser displacement sensor market is additionally catalyzed by notable measures taken by the governments all over the world so as to adopt industrial automation. However, high basic price, and increased maintenance cost of laser displacement senor are foreseen to hamper the development of the entire laser displacement sensor market.